It's another top honour for the team at Bristol Street Motors Hyundai in Peterlee after receiving the 'Overall Dealer of the Year 2014' award at the annual Hyundai dealer conference in Milton Keynes. Judged on overall performance including targets and customer satisfaction, the North West Industrial Estate dealership came out on top after beating more than 150 Hyundai dealerships across the UK. The dealership has recently been presented with a Motor Trader Industry Award for customer care and a prestigious European award from Hyundai for customer service. 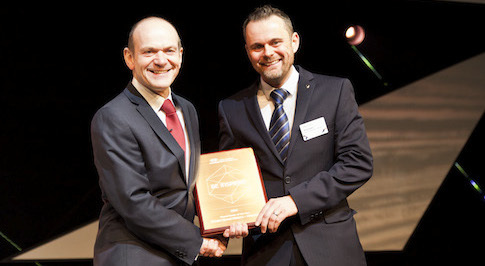 Billy Taylor, General Manager at the Bristol Street Motors Hyundai dealership collected the award at the Milton Keynes arena from Hyundai CEO, Tony Whitehorn. Billy, said: "It is an honour to receive such a prestigious award and it is a testament to the hard work and dedication of the team at Bristol Street Motors Hyundai Peterlee. "We strive for consistency at the dealership but we are always looking for ways to improve and customer feedback is an important part of this. I'm very proud of the team and all of their hard work through 2014  here is to a successful 2015."